Press releases usually make no impact upon me. I usually don’t even read them. (Sorry, all my friends in the PR industry!) There’s one from 2001 that I think about all the time, though. It’s the press release that Jagjaguwar issued alongside Oneida’s Anthem of the Moon album, where the writer (probably a band member, and probably writing with intentionally overblown rhetoric in order to see how gullible the music journalists of the day could be) declares that “the world has forgotten a huge part of the critical essence of the psychedelic experience.” The one-sheet specifically mentions “anxiety, dislocation, alienation and half-formed terror” as neglected tenets of psychedelia, ones that could be found on Oneida’s record (and, indeed, most of the albums they’ve released since), touting the sense of “exhaustion, ecstasy and paranoia” that defined their music. It’s been over 15 years since I first read that thing, and it still pops up in my head whenever I think about psychedelic music (which is something I think about a lot.) Paranoia, fear and claustrophobia are powerful sensations, and when a work successfully taps into them, really makes you feel them, it’s something you won’t soon forget. That’s what Thumper does, more than any game I’ve ever played before. It wouldn’t take much editing to make that press release work perfectly for Thumper. This is a rhythm game that intentionally runs counter to almost everything you’d expect from a rhythm game. Instead of club-ready dance music, soothing light shows and the warm hum of synesthesia, Thumper wants to discomfort us. It wants to leave us confused and afraid, overwhelmed by speed and the visual eruptions that happen when we don’t do what we’re supposed to. The track our scarab-like vehicle rockets through isn’t a playfield for our fingers to dance upon; it’s a tightly enclosed, claustrophobic space where we have to perfectly time split-second reactions to stay alive, pushing a button here, holding it down there, banking left and right with little notice, all while the track twists and slopes in unpredictable patterns, often with snaking tendrils writhing out into the darkness around us. Most rhythm games want to replicate the best time you could possibly have at a rave; Thumper wants you to feel like you’re shaking on the floor of a bathroom stall, praying for those weird shapes and sounds that surround you to go away. 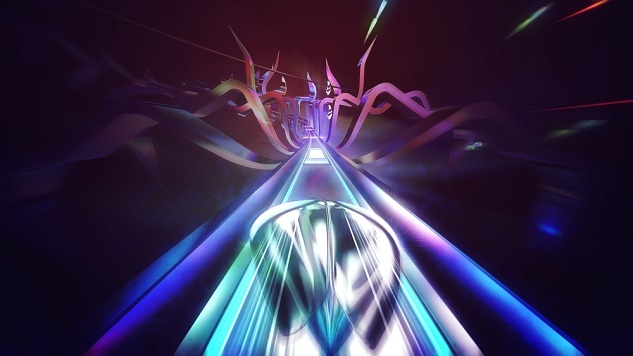 Like a rhythm game, the music is crucial to creating Thumper’s atmosphere. It doesn’t sound like any rhythm game that’s ever existed before, though. Thumper’s music sounds like something that would get raved about in The Wire (the magazine, not the TV show), something that would be released by Load Records, something that you’d hear on a good college radio station, if good college radio stations actually still existed anywhere. It’s heavily percussive, but these aren’t really beats you can dance to; they’re complex, prog-like rhythms with heavy, pounding, foreboding drums. Each beat has a weight to it, like it’s reverberating through a canyon, and when overlaid with drones and ambient sheets of noise it adds up to a soundtrack as cold and brutal as the game itself. The music can be suffocating even without headphones on. If you didn’t know that Brian Gibson of the essential noise band Lightning Bolt was one of the two designers responsible for Thumper, it would make immediate sense as soon as you found out. The soundtrack doesn’t sound like Lightning Bolt (it reminds me more of, I don’t know, fragments of various krautrock records, or some of Onedia’s later, more abstract albums) but it’s similarly challenging and similarly overpowering. You don’t just react to Thumper’s music, hitting buttons in time with the beat. You’re sort of having a conversation with it. Yes, the beats are reinforced by your input, but if you listen closely the game tells you what is about to happen. That curved wall that you have to quickly turn left at might seem to pop up with little warning, but if you were paying attention you would have heard its distinctive clang right before it fully came into view. Occasionally thin barriers will block the entire track, and you have to hold the action button down to break through them; you’ll hear their distinctive staccato pops shortly before you arrive at them, and then again if you crash through them properly. Thumper challenges you to pay full attention to it, listening for its changes and cues and reacting appropriately. It’s similar to how it feels to play music with other people—at first you might rely heavily on your eyes to see where their hands are going, but once you know how to really play your instrument, once you know how to listen to the notes and sometimes even anticipate them, you can start to work together in a way that almost transcends thought. I can tell almost immediately if I’m going to have a good run in Thumper. If I’m able to tune into those musical cues and respond without even thinking about it, I’ll probably do pretty well. If I’m even a fraction of a second off, or have a hard time isolating the right sounds within the game’s din, I’ll probably crash a lot. This is especially true with higher levels, where the tracks ditch almost all breathing room, pumping out obstacle after obstacle, even introducing snakes that shoot down the tracks and inescapable lasers that blow up my silver beetle if I miss a single button press. Thumper doesn’t necessarily want to brutalize me, and gives me everything I need to succeed, but it’s unforgiving when I’m not perfect at almost every single opportunity. That difficulty is suffocating. Along with the oppressive music and the stark graphics, it turns Thumper into a claustrophobic, stressful, frightening experience. It rattles around inside my brain when I’m not playing it, its velocity and brutality careening throughout as I try to unwind after playing. Thumper taps into art’s ability to alter our consciousness, introducing a new reality for us to get lost in, and it’s not afraid to let this dream world look and feel like a nightmare. Okay, I realize this probably sounds ridiculous. But I’m not overstating how Thumper makes me feel. And it accomplishes this even when I don’t play it in virtual reality. (Uh, yeah, it has a VR mode playable through Playstation VR, and yes, it’s tremendous, easily the best reason today to buy a VR headset.) There’s a certain class of game that gets stuck in my head, where I can’t stop seeing it and thinking about it even when I turn the machine off. Think Tetris, Ms. Pac-Man, Dark Souls, the best Metroids and Marios and Zeldas—the true classics, the cornerstones of the medium that have made an indelible impact on how we play and think about games. Thumper is right up there alongside them. It is an essentially perfect realization of its own unique goals and concerns, and a game we’ll be playing and celebrating for decades, even if it leaves us afraid and confused. Thumper was developed by Drool. It is available for the Playstation 4 and PC.